From the suicidal Blue Whale Challenge, now the internet has got its new crush, the so-called “Momo Challenge”. Recently we had also faced another dangerous commotion amongst the youngsters the “Kiki-Challenge”. What is exactly this “The Momo-Challenge”? People had heard about the delicious cuisine “Momos”. But one fine day from nowhere a challenge landed on the social media platform specifically Whatsapp and Facebook creating a huge chaos everywhere. The woman with scary features and eyeballs bulging out can give goosebumps to anyone. This can be the worst nightmare, worse than “The Nun”, great artwork, isn’t! The Internet was flooded with the questions about “The Momo Challenge”. This happened soon after the alleged suicide of a 12-year old girl in Argentina. Let us find more about it in our next segment. “The Momo-Challenge” is basically a cyber-bullying. This uses social media like Whatsapp and Facebook as its channel to threaten the user. Once the user gets trapped into the bait, he will be receiving some of the scariest graphic threats on their Whatsapp account. This will be followed by a set of instructions. The user is supposed to follow the instructions with respect to some dangerous tasks. These tasks will be very intense and may end up with taking away the life of the user. This Challenge was first identified by a You Tuber, ReignBot in July 2018. Reportedly, the challenge is said to have originated from Japan which was further spread to Latin America. Recently, from mid of May, the rumors regarding “The Momo Challenge” started spreading in India, Mexico, and Argentina etc. But fortunately, the cops did not receive any complaints regarding any possible harm caused by “The Momo Challenge”. Even on 29 August’18, the Central Investigation Department in West Bengal put a full stop to the claims of the media. These claims linked the death of two teens with that of “The Momo-Challenge”. The Department believes that the invitation to such challenges is spread locally as a prank to create a panic amongst the youngsters. The Odisha Police though warned the teenagers and their parents about the challenge. And asked media not to publish unconfirmed reports only for the sake of TRP. HOW IT IS IMPACTING THE STUDENTS? The trends of suicidal games are on their peaks across the internet. All the users especially the teenagers are vulnerable to such games out of their curiosity. Therefore they are targeted the most. The impact is not only physical but such cyber-bullying is psychologically having a huge impact on the students. The same has happened with “The Momo-Challenge”, if not real its rumor itself is creating a tremendous panic everywhere. The teenagers who are enticed with the game are threatened at the later stage to perform a series of activities. If they do not abide by the instructions, again they are threatened by the controller with violent images and videos. This pressurizes the student to take extreme steps. The game controller knows how to play with the mind of the students. This issue has drawn the attention of some educational boards. 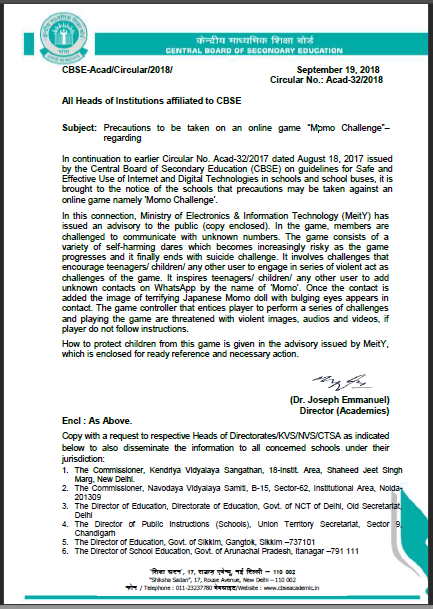 The Central Board of Secondary Education (CBSE) has recently issued a public advisory regarding “The Momo-Challenge” on its official website. It has warned the teenagers as well as their parents from any threat. Let us see, how much the conditions are going to improve. Whenever something wrong happens instead of analyzing the situation and trying to find a way out of it, people sub-consciously start thinking irrelevant things. During that course, they tend to take extreme steps especially the students. So what can be done to prevent our generation from the getting engulfed by “The Momo-Challenge”? Stalking??? It will be ridiculed by the students but parental-level stalking is sometimes a necessity. If you find your children to be distressed over something, never hesitate to ask them about the changes they are undergoing. Monitoring the children’s online activity will prevent them from engaging themselves in such activities. Install some good cyber software; this will help to supervise the activities of your children. If necessary, you may take professional help as well to prevent your child from getting trapped at some risk. Any scars like a symbol which was not present earlier on your child’s body should be identified and a proper counseling should be imparted. Parents, teachers, guardians, and sometimes friend’s alertness may prevent a student from getting engaged in such dangerous online games. As mentioned earlier, the Central Board of Secondary Education (CBSE) has issued a public advisory recently after the panic and chaos developed amongst the public. The CBSE has requested all the affiliated institutions to generate a proper awareness about “The Momo-Challenge” among the students. Actions should be taken if required. With the advent of the technology, such kind of online-challenges will keep on emerging, whether it is “Blue-whale Challenge” or be it “The Momo-Challenge”. The only thing which can keep us protected is our alertness. Learn from the mistakes of others, if any awareness is created, never take it for granted. There is where we always miss out, human tendency!!! Even all the state government are worried about this kind of cyber-bullying. In his regards, Sandeep Sengupta, Managing Director of Indian School of Ethical Hacking, said in a press release that the game administrators always keep a track on their potential victim. He has advised the public not to accept any invitation which calls for such kind of games. Not only this, he has suggested the public to renew their passwords on a regular basis. The killer-game will not kill unless we respond to it. But compelled with the human tendency, responsiveness, and curiosity is the basic trait. “The Momo-Challenge” can be eradicated from the internet if prevention is taken on the initial basis. Parents should be aware of such challenges and if any symptoms are identified, action should be taken. There is a great saying, Prevention is better than cure, so it is better to stay alert than to stay unconscious about the problem. A much needed post for the society. But more than the momo it’s musically which looks perilous in the current trend.